In the 1850s Jesse and Sarah Bostick made their home in Berrien County in the vicinity of present day Ray City, GA. Jesse Bostick, born 1836 in Duplin County, NC was the eldest son of Treasy Boyette and John Bostick. His wife, Sarah Ann Knight, was a daughter of Nancy Sloan and Aaron Knight of Berrien County, GA.
On March 22, 1862, Jesse S. Bostick enlisted in the Clinch Volunteers, which mustered in as Company G, Georgia 50th Infantry Regiment. This unit was quickly dispatched to Virginia where they engaged in battle. Through 1862 and 1863 they fought battles all over Virginia, Maryland, West Virginia and Pennsylvania. The 50th GA Regiment’s bloodiest day was September 14, 1862 at the Battle of South Mountain, where the 50th GA Regiment suffered a casualty rate of 86% – 194 killed or wounded out of an effective force of about 225 men (see William Guthrie and the Bloody Battle of South Mountain). While Jesse was away fighting in the war, tragedy struck at home. In 1863, his wife and youngest daughter died. Jesse continued to fight with his unit in engagements at Gettysburg, PA and Knoxville, TN among others. About 15 Feb 1864, shortly after the battle at Cumberland Gap, TN, he was promoted to Full 3rd Sergeant. In the late summer and early fall of 1864, the 50th Georgia Regiment was fighting all up and down the Shenandoah Valley. The 50th Georgia Regiment was a part of General Kershaw’s Division, in General Early’s Army of the Valley. The Union forces under the command of General Philip Sheridan were engaged in destroying the economic base of the Valley, including crops in the field and stored goods, attempting to deprive General Robert E. Lee’s army of needed supplies. In mid-October Sheridan’s Army of the Shenandoah was encamped at Cedar Creek, Virginia while the 50th Georgia Regiment and the rest of General Early’s Confederate forces had withdrawn to defensive positions at Fisher’s Hill, about three miles distant. Believing the Confederate units in Shenandoah Valley too weak to attack his numerically superior force, on October 15 Sheridan returned to Washington D.C. to meet with General Grant and Secretary of War Staunton to begin planning the next phase of the war. By October 18, Sheridan was returning to the scene and while in route spent the evening of the 18th at nearby Winchester, VA. Seizing on the over confidence of the Union forces, Confederate General Early decided to launch a surprise attack across Cedar Creek in the early morning hours of October 19, 1864. The men of the 50th Georgia regiment spent the day before the attack in preparations, cooking provisions and stocking their ammunition. Early deployed his men in three columns in a night march, lit only by the moon. The men moved out at midnight, with all gear secured against chance noise they marched in silence. By 5:00 am Kershaw’s Division crossed Cedar Creek at Bowmans Mill Ford, with the 50th Georgia Regiment in the lead. Just before sunrise, operating under a cover of dense fog, the confederate forces struck. The surprise was complete, and the Union position was quickly overrun. The Confederates took hundreds of Union prisoners, many still in their bedclothes, and captured eighteen guns. Sheridan was away at Winchester, Virginia, at the time the battle started. Hearing the distant sounds of artillery, he rode aggressively to his command. 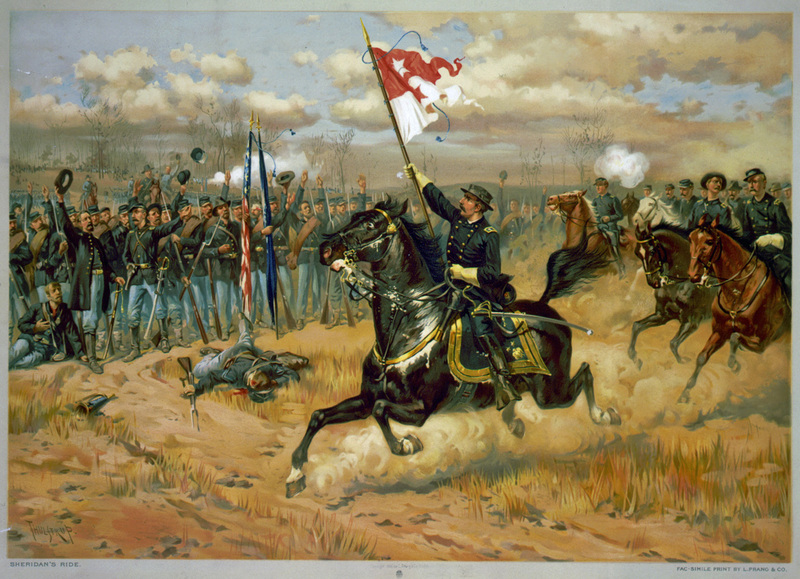 (Thomas Buchanan Read wrote a famous poem, Sheridan’s Ride, to commemorate this event.) He reached the battlefield about 10:30 a.m. and began to rally his men. Fortunately for Sheridan, Early’s men were too occupied to take notice; they were hungry and exhausted and fell out of their ranks to pillage the Union camps. Sheridan’s Ride, October 19, 1864. By 4 p.m., Sheridan had rallied and reorganized his troops to mount a counterattack. The Union divisions were now reinforced by Brig. Gen. George A. Custer‘s cavalry division, which broke the Confederate lines. Custer’s cavalry chased the disorganized Confederates all the way back to Fisher’s Hill. The destruction a bridge in the Confederate rear cut off their escape route, “blocking up all the artillery, ordnance and medical wagons, and ambulances which had not passed that point.” At Fisher’s Hill, the Confederates managed to regain some composure, organizing a defense and an orderly retreat. Despite the reversal, the Confederates took with them some 1500 Union prisoners that had been captured in the morning’s attack. Casualties on the Confederate side were estimated as being “about 1,860 killed and wounded, and something over 1,000 prisoners” captured by Union forces. The Union took 43 guns (18 of which were their own guns from the morning), and supplies that the Confederacy could not replace. The battle was a crushing defeat for the Confederacy. They were never again able to threaten Washington, D.C., through the Shenandoah Valley, nor protect the economic base in the Valley. The reelection of Abraham Lincoln was materially aided by this victory and General Phil Sheridan earned lasting fame. It is estimated that the Georgia 50th Regiment suffered more than 50% casualties in the Battle of Cedar Creek. In Jesse Bostick’s unit, Company G, two men were mortally wounded, two others received wounds and nine were taken prisoner. 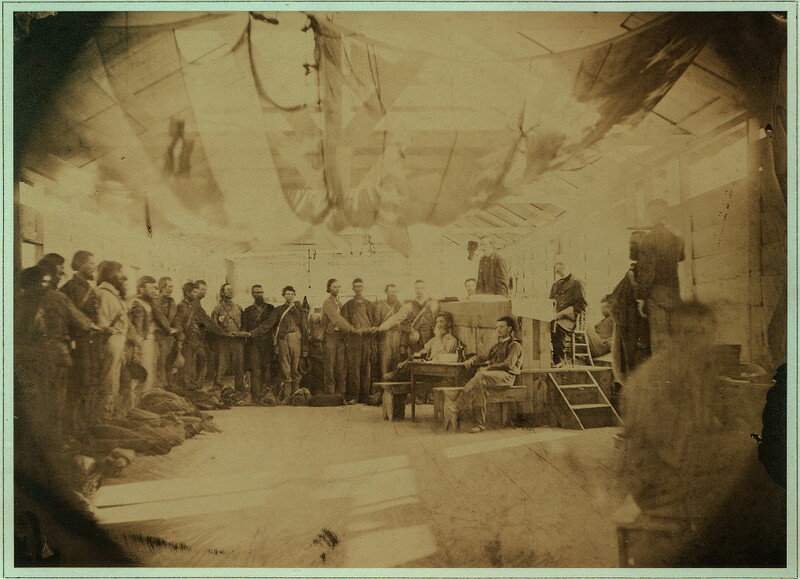 Quarterman Staten, Captain of Company G, was severely wounded, but was transported to a hospital and eventually furloughed home to Echols County, GA.
Jessie Bostick was among those captured. 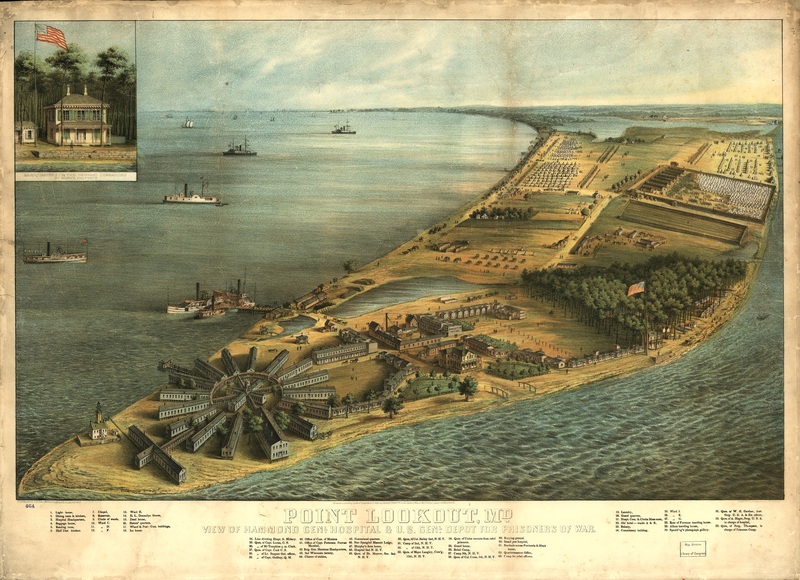 As a prisoner of war he was sent to Point Lookout, Maryland, one of the largest Union POW camps. During the war, a number of captured soldiers from the Ray City area and Berrien County went through the POW depot at Point Lookout, among them John T. Ray, Benjamin Harmon Crum, Benjamin Thomas Cook and Aaron Mattox. The conditions at Point Lookout were horrific – more than 20,000 men crammed into tents in a prison built to hold 10,000. Nearly 4000 Confederate prisoners died at Point Lookout, about 8 percent of the 50,000 men who passed through the prison camp during the war. Point Lookout, MD. Hammond General Hospital and U.S. General Depot for Prisoners of War. Jesse Bostick survived at Point Lookout for four cold months before finally being exchanged on March 21, 1865. With the end of the war, Jesse Bostick returned to his home in Berrien County, Ga. Within six months of the surrender at Appomattox Courthouse, Jesse Bostick married Mrs. Nancy Corbitt Lastinger. She was the widow of James G. Lastinger, another confederate soldier who served with the 29th Georgia Regiment (the Berrien County Minutemen) and died in a Union hospital in 1864. Jesse and Nancy Bostick lived out their days in Berrien County, GA. They were buried across the Alapaha River in present day Atkinson County at Live Oak Cemetery, where others of the Corbitt family connection are buried. Jesse Bostick, born 1836 in Duplin County, NC was the eldest son of Treasy Boyette and John Bostick. In the mid 1800s he came with his parents to South Georgia and they settled near present day Lakeland, GA) about 10 miles east of the Ray City, Georgia area. 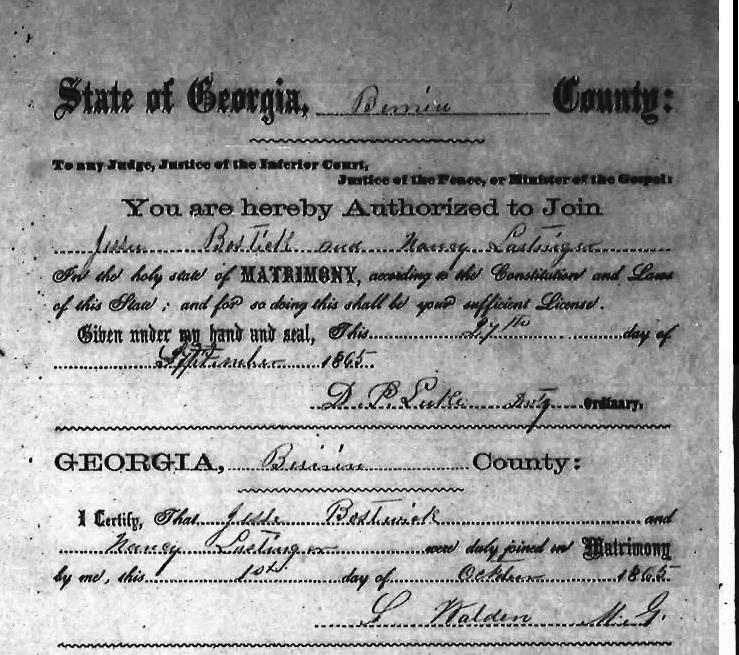 On July 3, 1856 Jesse Bostick married Sarah Ann Knight in Berrien County, GA. She was a daughter of Nancy Sloan and Aaron Knight. The bride’s grandfather, William Anderson Knight, performed the ceremony. The Knights were among the earliest pioneer families to settle in the Ray City area. 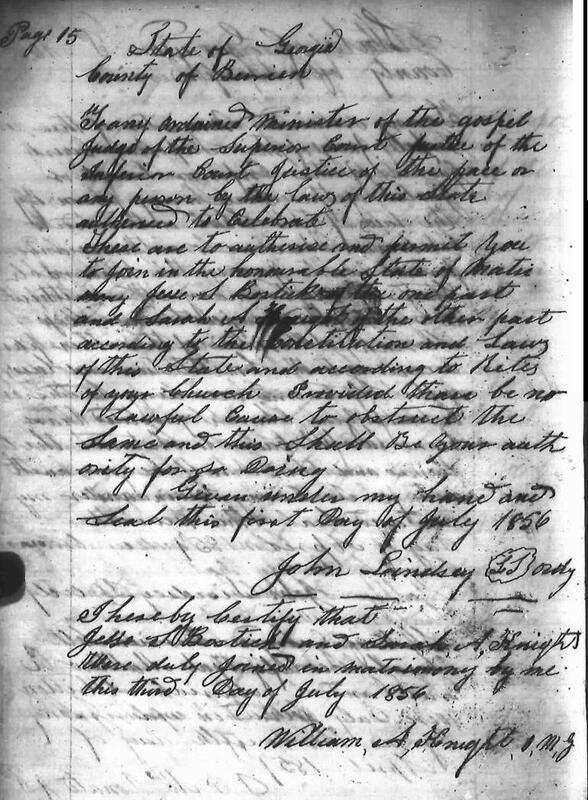 Marriage of Jesse Bostick and Sarah Ann Knight, July 3, 1856. Jesse and Sarah Bostick made their home in Berrien County in the vicinity of present day Ray City, GA, next to the home of Sarah’s brother, John W. Knight. Jesse worked as a farm laborer, as he had no real estate or personal estate of his own. Perhaps he worked for his brother-in-law, who had a substantial plantation. Sarah E. Bostick, born 1860, died young. During the Civil War, Jesse S. Bostick enlisted in Company G, Georgia 50th Infantry Regiment. While Jesse was away fighting in the war, tragedy struck at home. In 1863, his wife and youngest daughter died. 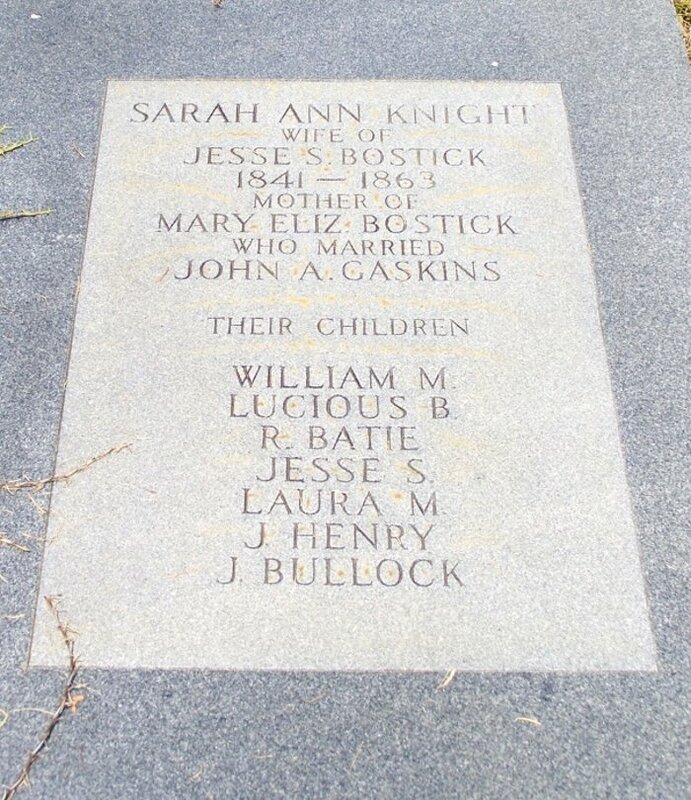 A memorial to Sarah Ann Knight (1841-1863), wife of Jesse Bostick, appears on the gravemarker of her daughter, Mary Bostick Gaskins, at Empire Cemetery, Lanier County, GA.
Jessie Bostick was captured at the Battle of Cedar Creek, and imprisoned at Point Lookout, MD. With the end of the war, Jesse Bostick returned to his home in Berrien County, Ga. Within six months of the surrender at Appomattox Courthouse, Jesse Bostick married Mrs. Nancy Corbitt Lastinger. She was the widow of James G. Lastinger, who served with the 29th Georgia Regiment (the Berrien County Minute Men) and died in a Union hospital in 1864. Nancy Corbitt had come from Tennessee to Clinch County, GA sometime prior to 1860 with her widowed mother and siblings. The census of 1870 shows Jesse, Nancy, and Jesse’s daughter, Mary, living in the household of Nancy’s younger brother, Monroe Corbitt. Monroe was also a Confederate veteran having served as a sergeant in Company H, 29th Georgia Regiment, and he had managed to retain a farm even through the war years. The Corbitt farm was in the 1148 Georgia Militia District of Berrien County. Jesse worked as a farm laborer, while Nancy and Mary assisted with housekeeping and domestic chores. Later the Bosticks lived in the Willacoochee area in Berrien County. 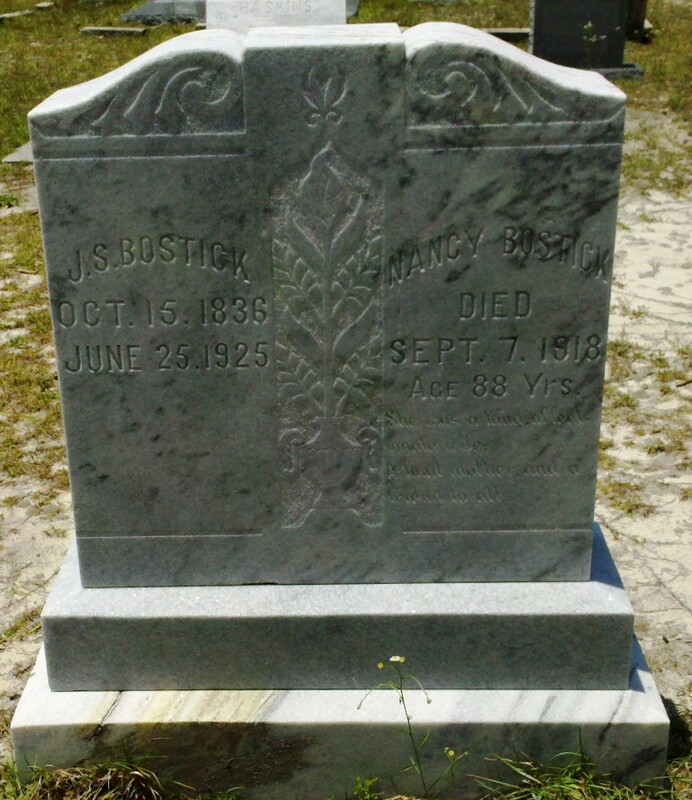 Nancy Bostick died September 18, 1918 and Jesse Bostick died August 21, 1925 in Berrien County, GA. They are both buried at Live Oak Methodist Church, in present day Atkinson County. Gravemarker of Jesse Bostick and Nancy Corbitt Lastinger Bostick, Live Oak Cemetery, Atkinson County, GA.